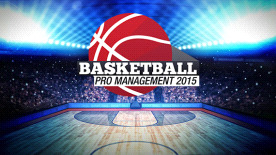 Now in its fourth year, Basketball Pro Management 2015 introduces numerous features and improvements. Among these upgrades, managers this year can look forward to more challenging and tactically-minded AI opponents, enhanced recruiting, and a refreshed league-satisfaction system. In addition to rankings and budgets, an effective manager has to plan for the growth of individual players and the team's performance. Recruiting has been redesigned to offer significantly more depth through the addition of league-specific regulations, including leagues from North America, China, Turkey, and many more worldwide. Running a successful team takes more than good coaching skills. Team-rank, performance against rivals, and a wide variety of other parameters all affect the support you receive from fans and owners, and in turn, the income from tickets and stadium shops. Manage your goals wisely. After all, the most competitive players don't come cheap.